How do you make your staircase a part of the style of your home without losing a safe path between floors? Stairs are easy to look past and not use in creative, purposeful ways. In a multi-story home, it is easy to see a stairway as purely functional. It's simply the means to getting from one story to another. A tall house offers the chance to bring stairs to the forefront and highlight what they can do for a home. With so many ways to make your staircase a true design element, it’s a shame to waste the opportunity. Here are a few ideas that can add that extra touch to your home’s staircase. The basic staircase is a simple ramp of evenly spaced stairs that have closed risers holding up wooden treads. These treads lead to landings that are closed in by handrails, and occasionally walls. In order to maintain safety, stairs often extend into a room or space far enough to allow plenty of room to stand on each tread. Treads can be carpeted, wooden, or made of tile or stone depending on their size and shape. There are many ways you can make your staircase stylish without blocking the path with vases and decorative knick-knacks. Paint can make a simple stairway stand out. It is very popular today to paint the riser under each stair. Choose a single pop of color to bring the eye all the way can serve as the focal wall of color in your space. Patterns and variegated colors create something more eclectic and fun. Chalkboard paint, or a series of words that reveal a favorite quote, are more fun ways to make the risers decorative. Applying coordinated wallpaper to the risers to create patterns and play with colors is also an easy option if you want to avoid painting. 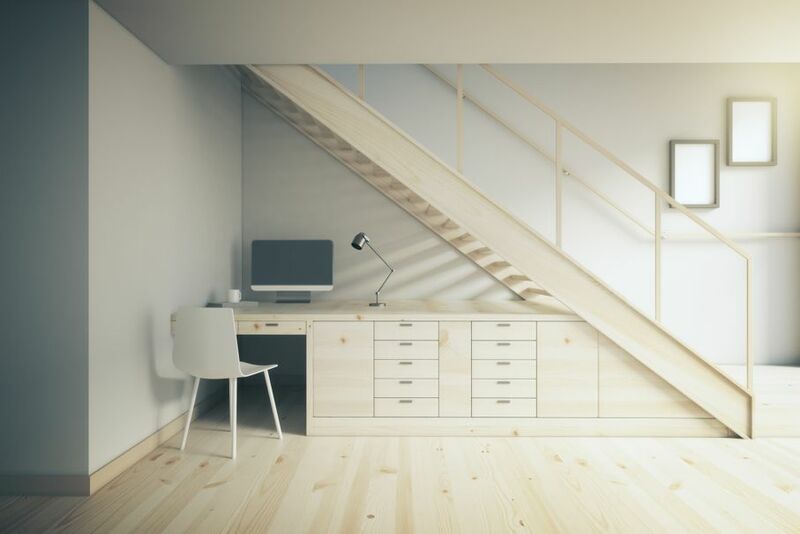 Homeowners who struggle to find enough storage space can find the stairs to be a useful tool. Risers that can open and close make sturdy drawers that pull out from underneath each tread. Treads could also be hinged lids that open up to reveal storage space. If you choose the hinged option, consider the amount of space a landing could offer. One tread can have the depth to store four or five extra linens or seasonal toys. Homeowners that choose this option should always make sure the drawers are carefully closed after use. The side of the staircase could also be filled with drawers for craft supplies or other storage. 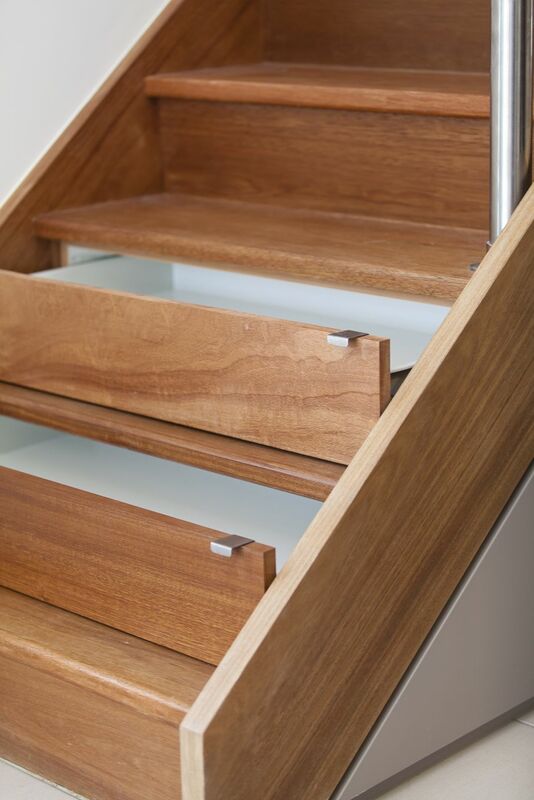 With its central location and geometric layout, stair drawers may be easier to organize than a traditional closet. The space underneath your staircase can be used for a number of things. If you don’t want to add more storage in that area, you can open it up to make your home more open and reveal more floor space. You can also think of the area as a functional room. Try adding a desk under a steep staircase where there’s a bit more room for a person’s head. A staircase ‘office’ can be the perfect place to tuck your desk when you don’t have other options for a home office. Create a reading nook by adding a low, comfortable chair, a low bookshelf, and a curtain for added privacy. A simple desktop lamp and a cozy rug can transform the nook into the most comfortable reading spot in the house. You can also turn the under-stair closet into a powder room for guests. This remodel is deceptively simple. Add a bit of plumbing for a toilet and a sink and decorate with lighting and paint. Adding an extra half bath to your home can drastically increase the home’s resell value, and it’s a clever way to make resourceful use of otherwise ignored space. 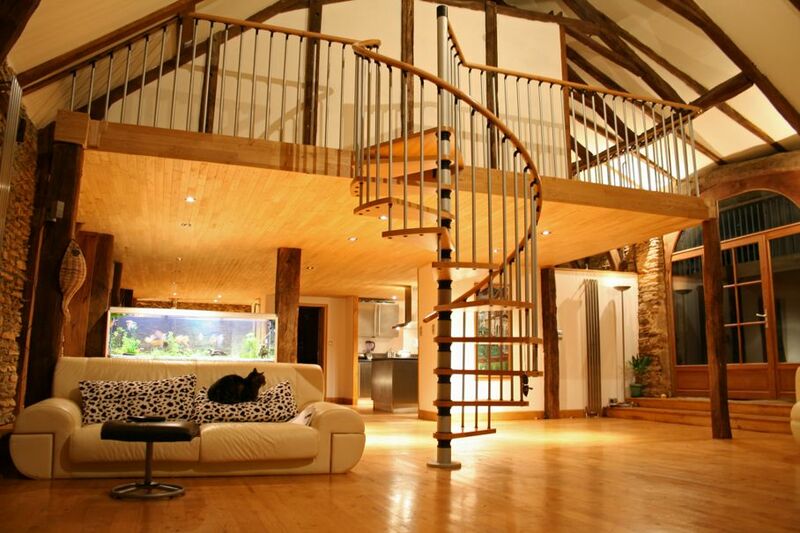 Spiral staircases are a glamorous, romantic addition to any home. However, as you try to decide how to arrange furniture around the spiral, or how to move things up and down between floors, they can become a difficulty. Their one big advantage over the traditional staircase is that they take up much less space. Their vertical design doesn't intrude into your space, conserving precious floor area, especially in a small apartment or house. For a spiral staircase situated in the middle of a room, it is best to arrange your furniture facing away from the stairs. 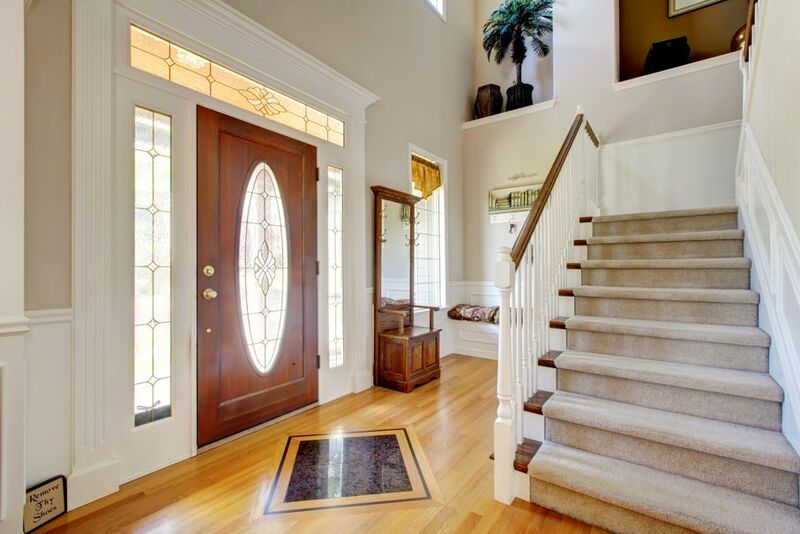 Create conversational groupings that aren’t broken up by the stairs and leave room for a traffic path between the two. 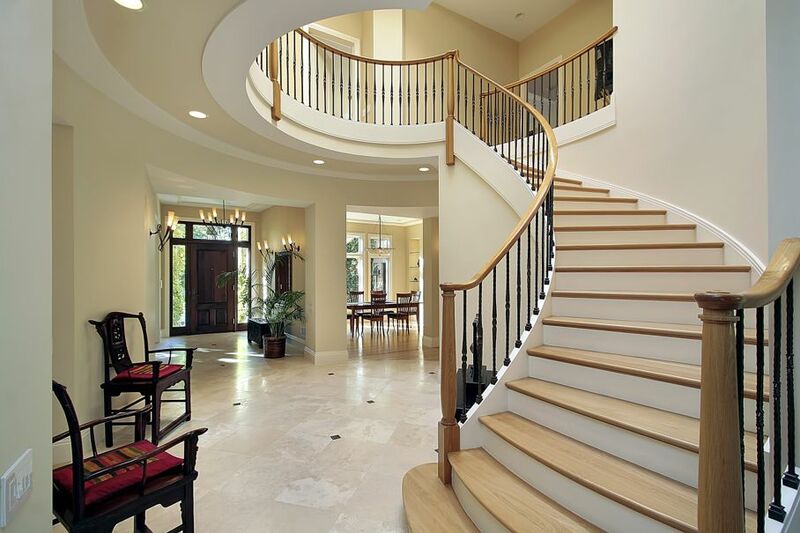 If you have a staircase in your home, you know the challenges it presents as a design element. Yet, with the right adjustments, your staircase can be a way to carry the mood of your house between floors, uniting them in theme and tone. Take these ideas and make your staircase an exciting, stylish element to your home.